Audiophiles looking for the ultimate classic 300B tube amplifier for their high-efficiency speakers will delight in the "Raven"! Based on the most popular triode in the history of audio. 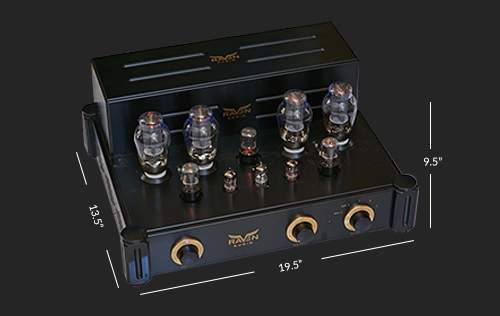 Audiophiles looking for the ultimate classic 300B tube amplifier for their high efficiency speakers will delight in the "Raven"! Based on the most popular triode in the history of audio. "when I heard it through my system I cried a little"
"Every King Crimson album in my collection persisted in sounding best at higher-than-average playback levels, with which the Ravens were very comfortable. And even at those higher-than-average playback levels, the Ravens maintained their poise and clarity. Listening to Bernard Haitink and the Royal Concertgebouw Orchestra's recording of Mahler's Symphony 3 (2 LPs, Philips 802 711/12AY), I was impressed with the clean sounds of horns and, especially, cymbals, the latter free from congestion and hash. More notable were the clean sounds of the timpani and bass drum early in the first movement—the Ravens made it easy to hear and feel each individual application of mallet to skin, without smearing or overhang." If you don’t need the Reflection’s brute power, and instead wish to gently persuade your high-efficiency speakers to musical nirvana, you can choose our company’s namesake product, the Raven 300B Integrated Amplifier. Similar to the Reflection in almost every way but, instead of using the time-honored base circuitry that makes the best use of the 300B power triode first invented by Western Electric back in 1938. A few years back Raven Audio set out to create the best 300B product possible. The goal was to create a product we could put our brand on, that all-important reputation maker. What we ended up with is a specially integrated amplifier that we think you will be astonished by. This is the ultimate ultra-high efficiency speaker amplifier.